In this lesson, we will learn the important ideas behind equivalent fractions and how to find these fractions. One of the most important thing that we need to know when learning fractions is to be able to find fractions that are equivalent. A good understanding in this will help you to solve problems that involve fractions with different denominators. You can proceed by reading the study tips first or watch the math video. You can try out the practice questions after that. The math video below will explain more. In this lesson, we will learn about equivalent fraction. We will also learn how to find them. Let's start. 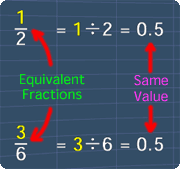 Equivalent fractions are fractions that have the same value. What does this means? Let's find out. Consider this fraction, 1/2. We know that this fraction is the same as 1 divides 2, which is equals to 0.5. Again, let's consider this fraction 3/6. This fraction is the same as 3 divides 6, which is also equals to 0.5. Notice that, these 2 numbers are the same. So, this means that these 2 fractions are equivalent. Now, with this in mind, let's examine this visually to understand this better. We are going to use these 2 fractions, 3/4, to further elaborate on this. Let's start finding fractions that are equivalent to 3/4. To find these fraction, we just need to multiply the fraction's numerator, and denominator with the same number. For example, we can multiply the numerator 3, with 2, and the denominator 4, with 2. This gives the fraction 6/8. Now, we can visually see that 6/8, is equivalent to 3/4, because the total height of the colored parts remains the same. Next, let's multiply the numerator 6, with 3, and the denominator 8, with 3. Now, this fraction becomes, 18/24. Again, since the total height of the colored parts are the same, these 2 fractions are equivalent. Now, why do we need to multiply both the numerator and denominator with the same number? In order to explain this, lets say that we only multiply the denominator with 2. This gives 3/8. Here, we can easily see that these 2 fractions are not equivalent. This is because the total height of the colored parts are not the same. Hence, to make them the same again, we need to multiply the numerator with the same number, which is 2 for this case. This gives 6/8, and now these fractions are equivalent again. 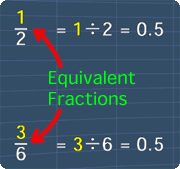 With this, we can say that equivalent fractions can only be obtained by multiplying the numerator and denominator with the same number. Next, can we also get E.F from division? Let's find out, using this fraction 18/24. Notice that, we can divide the numerator with 6, and denominator with 6. By doing so, we have the fraction, 3/4. Since the total height of the colored parts remains the same, these 2 fractions are equivalent. Here, note that this fraction is a simplified fraction. This is because we are not able to continue to do any more division on it. Now, how about addition or subtraction? Let's find out, by adding 2 to the numerator and denominator. After doing so, we can see that the total heights of the colored parts are not the same. So, addition does not gives E.F.
Next, by subtracting the numerator and denominator with 2, again we can see that the total heights of the colored parts are not the same. So, subtraction does not gives E.F. Therefore, we know that, we can get equivalent fractions from multiplication or division, and not from addition or subtraction. That is all for this lesson. Try out the practice question to test your understanding. You can start by going through the series of questions on equivalent fractions or pick your choice of question below. Question 1 on finding fractions that are equivalent.